You can upload and share your own seasonal recipes for it to appear on future editions of this page, using the form found here. We would love to see what you foodsters are creating, so please get involved! Just fill in the form, upload a pretty photo and you’re away! We have to approve the seasonal recipes you submit before it will be listed on our recipes page, but if it hasn’t gone up in a day or so feel free to let us know. You can also upload a featured image using the form below and it will be added to your seasonal recipes listing. Just make sure it’s a square image, no less than 320 x 240 pixels for best results. Here is a recipe that we are sure you will enjoy making and eating! 2. 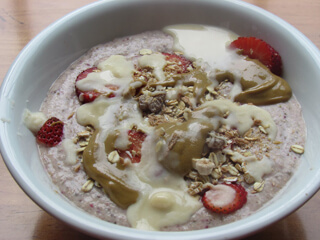 Combine the oats, oat bran, coconut, almonds and sunflower seeds in a bowl and mix by hand. 3. Dissolve the honey and oil in the hot water. 4. Pour the honey, oil and water mixture into the bowl with the oats mixture and quickly stir to combine. 5. Spread this mixture loosely over the base of an oven tray and place in preheated oven. 6. Return to check and turn the oats with a wooden spoon until all contents are nicely browned. The browning process will take approximately twenty to thirty minutes, depending on your oven! NB: It is important to turn the oats every ten minutes in order that it does not clag together but is light, aerated and golden brown throughout. 7. Remove oven tray from oven and allow to cool for a few minutes on a wire rack. 8. Turn the mixture once more to prevent it sticking together as it cools. 9. After about ½ an hour the muesli will be cool and you may add the dried fruit, simply stirring in with a wooden spoon. Tip – This recipe keeps well, so it is fine to make a bulk quantity and store it in an airtight cereal jar, container, or tin. It has long been a traditional to serve a nice hot, nourishing broth to the sick and also to travellers after a long journey to warm digestion and invigorate a weary body. In recent times this simple, versatile dish dating back hundreds of years, has been retagged as ‘Bone Broth’. The taste should be light and savoury, while all ingredients are nutritious it is important to remember that ‘more’ is not ‘better’. Too much meat or poultry will have the broth tasting heavy and gamey’. Too many vegetables unfavourably changes the whole taste of the dish. For a nourishing starter and a solid base to most dishes, please read on! 1. Place the bones in a pot and cover with just enough cold water to cover everything. 2. Bring the bones to a gentle boil and boil for 5 minutes. 3. Remove the bones and discard boiled water. 4. Replace the bones in the pot with the celery, carrots, garlic and the onion cut in half. 5. Add 3 litres of water and the salt and bring to the boil again. 6. Allow to boil gently for 2-3 hours until the vegetables are well cooked and the bones virtually fall apart. 7. Scoop out all the bones and the vegetables (the carrots may be eaten as a side dish). 8. Allow to cool a little and then run the broth through a sieve until all the solid ingredients have been taken out. The broth should be reasonably clear and either light yellow or light brown, depending on whether chicken or beef was used. 9. Refrigerate as soon as possible to cool quickly. 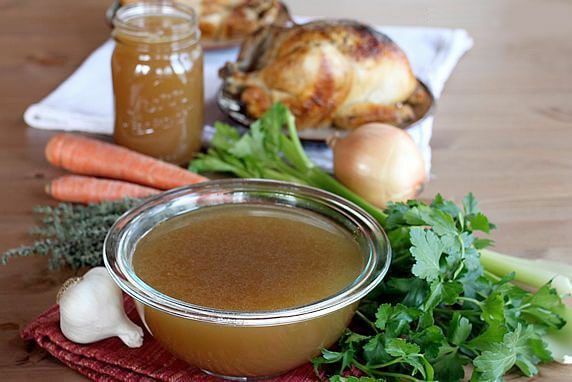 Tip – The broth may be refrigerated but is best used within five days. Alternatively, this broth or ‘stock’ may be frozen and thawed ready to be used as a soup or the liquid base to gravies, stock for cooking rice, polenta and many other dishes.